Playing with a heavier Badminton Racket can be tiring and tough on your shoulder and elbow. Introducing Astrox 55, a superlight badminton racket with Rotational Generator System. Don't let the light frame fool you. This racket packs quite a punch and is ideal for players looking for faster racket swings and swift net drops and touches. 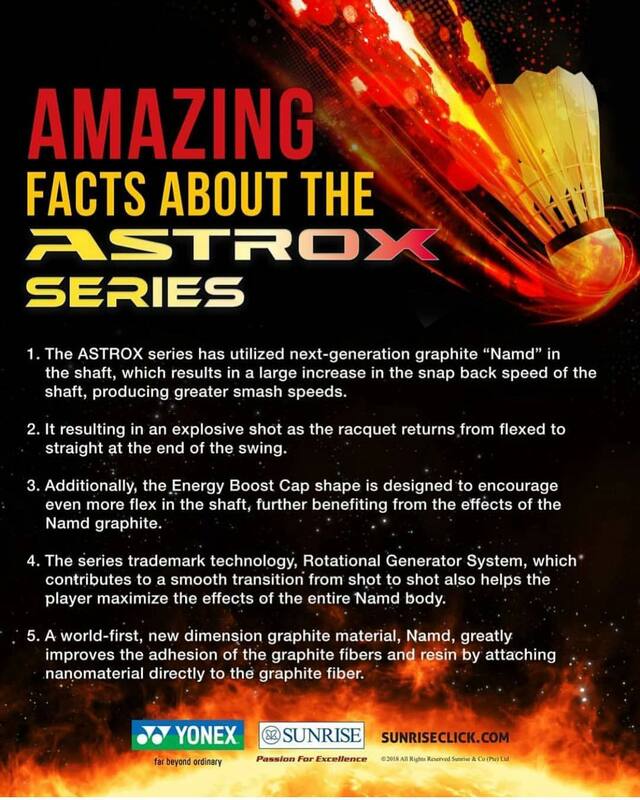 The Astrox 55 is developed with Namd, the world’s first graphite that flexes for power and hardens for control. By combining the Rotational Generator System, a technology shared by all racquets in the ASTROX line, with an overall reduction in weight, to perfectly match the swing speeds of intermediate players, the ASTROX 55 increases maneuverability during power shots, such as smashes, ultimately increasing smash speed. Additionally, the shaft employs the next-generation graphite material Namd, which helps it to quickly flex and return to normal, further increasing smash speeds. New dimension graphite Namd - A world-first, new dimension graphite material, Namd, greatly improves the adhesion of the graphite fibers and resin by attaching nanomaterial directly to the graphite fiber. In high performance racquets, it is common to combine nanomaterials with resin that connects graphite fibers, but in Namd, nanomaterials directly adhere to the graphite fibers and resin is greatly increased. This major improvement produces a shaft that flexes and stores energy, delivering explosive force on impact with the shuttle. 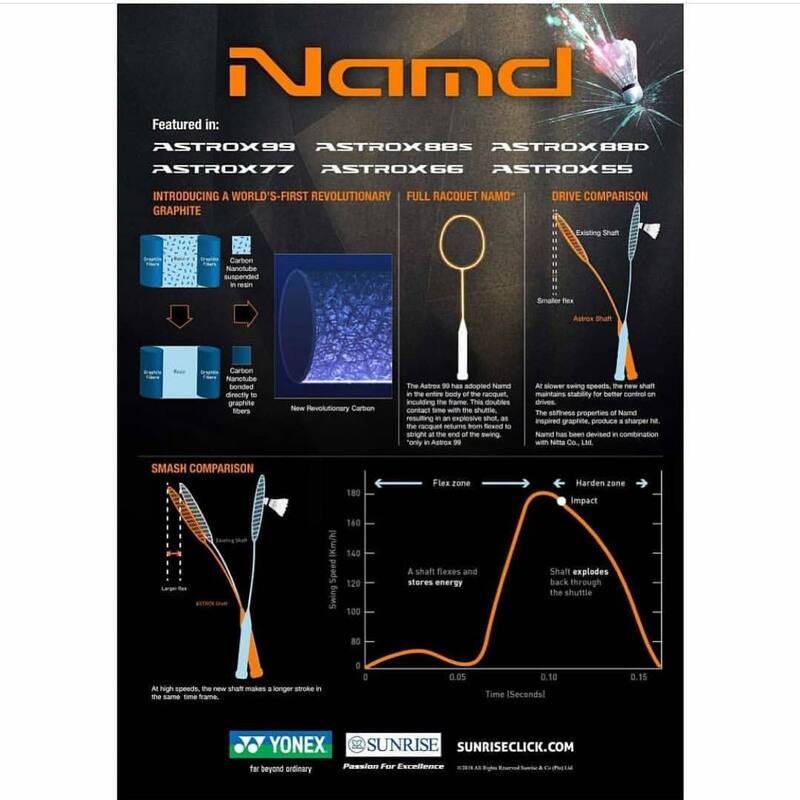 In the ASTROX 99, Namd has also been incorporated in the racquet frame, which helps it to “hold” the shuttle, increasing contact time and, resultingly, the speed and force with which it is expelled.